Each month, the Tennessee Department of Finance & Administration (F&A) reports how much tax revenue the state collected for the previous month. These reports help policymakers and the public understand how actual revenue collections compare to estimates from the start of the fiscal year. 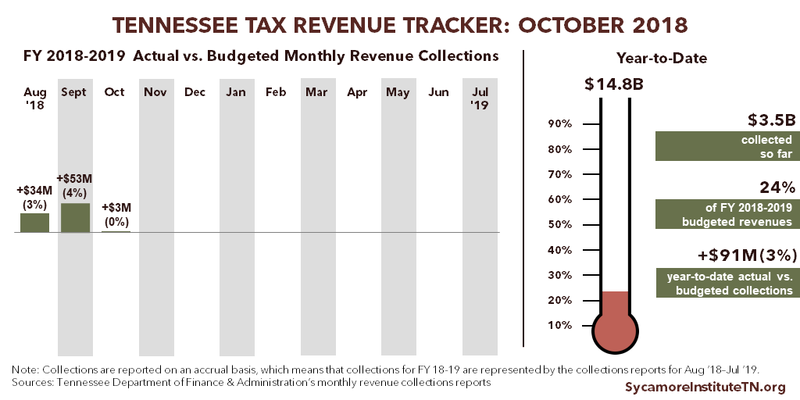 The Sycamore Institute’s Tennessee Tax Revenue Tracker, updated monthly, provides a quick visual snapshot of each report. The image below shows Tennessee’s revenue collections so far in FY 2019 relative to the estimates for which the state “budgeted” at the start of the fiscal year. 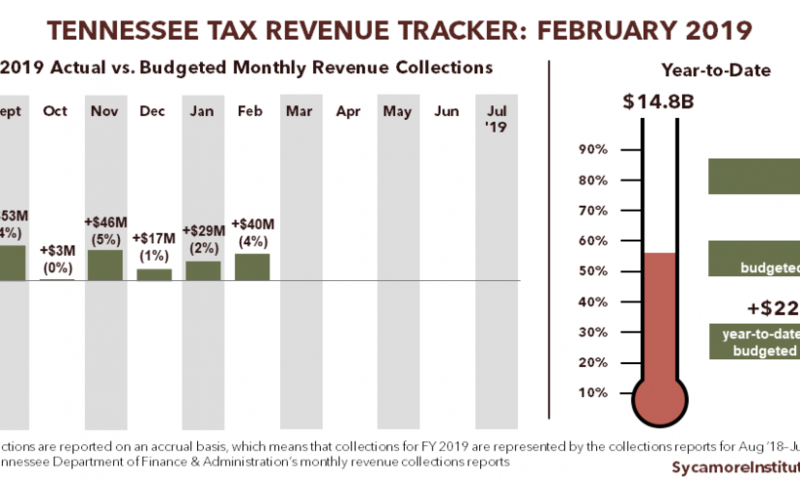 Actual collections for February 2019 were about 4% higher than budgeted. As of February 28, 2019, Tennessee had collected about 56% of the $14.8 billion in total budgeted revenue for the current fiscal year. Collections through February were about $223 million higher (or 3%) than what was budgeted for the time period. For additional details, read F&A’s official February 2019 report on revenue collections. 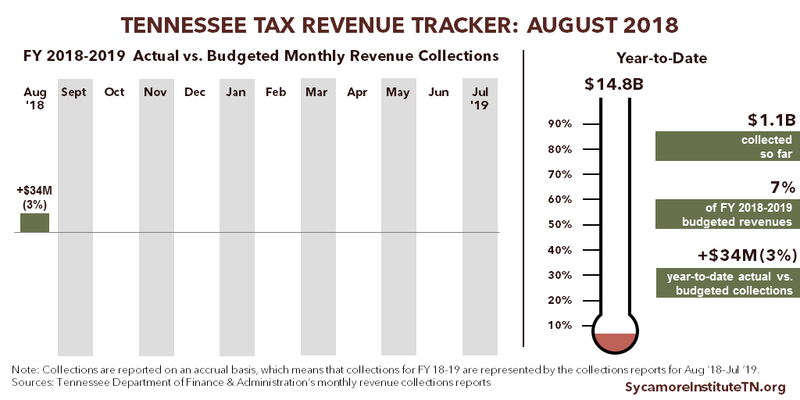 Forecasting how much tax revenue Tennessee will collect in a given year or month is a difficult but important part of maintaining a balanced budget, which the state constitution requires. F&A’s revenue forecasts have a major influence on decisions about spending. Overestimating revenues could force state policymakers to cut spending mid-year. On the other hand, underestimating revenues creates unplanned surpluses which can be spent the following year or saved in the rainy day fund. The trade-off of a surplus is that policymakers may have preferred to either spend the money or reduce taxes in the current year. The image below shows Tennessee’s revenue collections so far in FY 2018-2019 relative to the estimates for which the state “budgeted” at the start of the fiscal year. Actual collections for January 2019 were about 1% higher than budgeted. As of January 31, 2019, Tennessee had collected about 49% of the $14.8 billion in total budgeted revenue for the current fiscal year. Collections through January were about $183 million higher (or 3%) than what was budgeted for the time period. For additional details, read F&A’s official January 2019 report on revenue collections. Actual collections for December 2018 were about 1% higher than budgeted. As of December 31, 2018, Tennessee had collected about 40% of the $14.8 billion in total budgeted revenue for the current fiscal year. Collections through December were about $154 million higher (or 3%) than what was budgeted for the time period. For additional details, read F&A’s official December 2018 report on revenue collections. 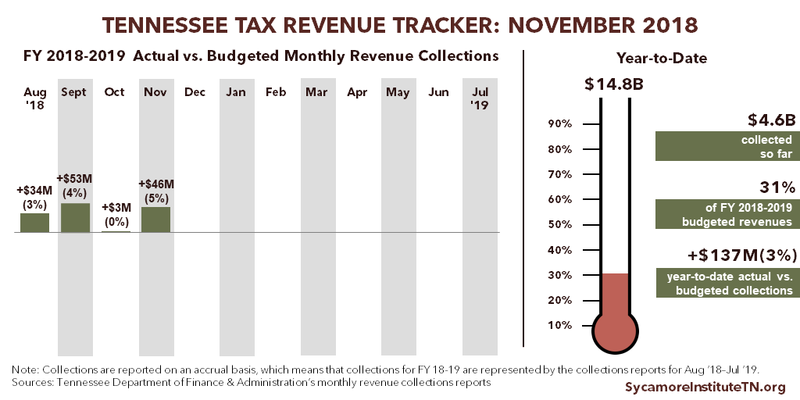 Actual collections for November 2018 were about 5% higher than budgeted. As of November 30, 2018, Tennessee had collected about 31% of the $14.8 billion in total budgeted revenue for the current fiscal year. Collections through November were about $137 million higher (or 3%) than what was budgeted for the time period. For additional details, read F&A’s official November 2018 report on revenue collections. Actual collections for October 2018 were just slightly higher than budgeted. As of October 31, 2018, Tennessee had collected about 24% of the $14.8 billion in total budgeted revenue for the current fiscal year. Collections through October were about $91 million higher (or 3%) than what was budgeted for the time period. For additional details, read F&A’s official October 2018 report on revenue collections. 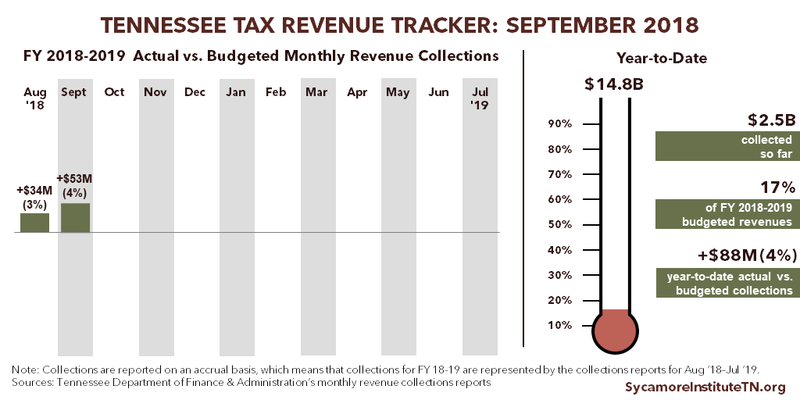 Actual collections for September 2018 were about 4% higher than budgeted. As of September 30, 2018, Tennessee had collected about 17% of the $14.8 billion in total budgeted revenue for the current fiscal year. Collections through September were about $88 million higher (or 34) than what was budgeted for the time period. For additional details, read F&A’s official September 2018 report on revenue collections. Actual collections for August 2018 were about 3% higher than budgeted. As of August 31, 2018, Tennessee had collected about 7% of the $14.8 billion in total budgeted revenue for the current fiscal year. Collections through August were about $34 million higher (or 3%) than what was budgeted for the time period. For additional details, read F&A’s official August 2018 report on revenue collections.